It’s too windy to go out on the ocean today – so here I am again, working about the house, cleaning the doggy yard up – which is the fenced in area between the cabin and the house (kitchen area). Lord knows, it needs it after a full winter of doggy doo doo and other filthy things that are left behind after the winter snows have gone. But, I can only do this for so long and I need some variety. There needs to be SOME fun in life, every day, I say! Looking for antler sheds has long been a past time of mine – but I usually do this for whitetail deer back in Minnesota. Here in Alaska, I guess we do it for moose. 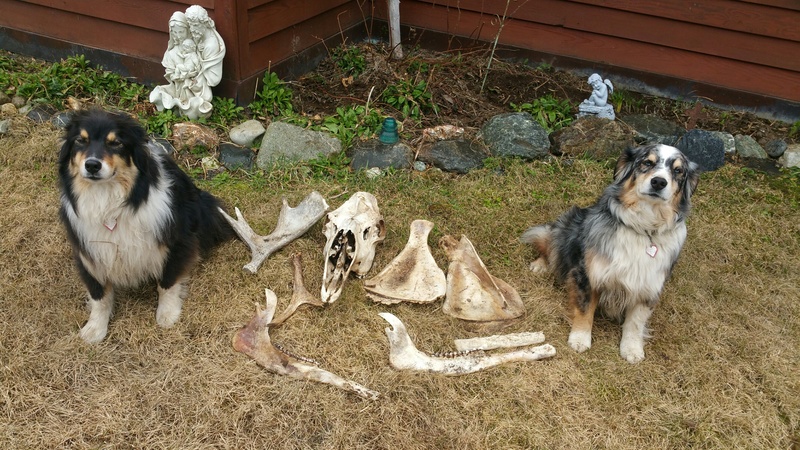 I’m not experienced at this, but I know that lots of moose live in town; there is lots of moose dookie on the hill above the house to prove it, so I took the two “knuckleheads” (Maria’s dogs Brody and Blue) on a little walk to look for “treasure.” This is what we came up with: two antlers, two scapulas, two jaw bones, and one skull (the dogs led me to a carcass a few hundred yards up the hill from the house). 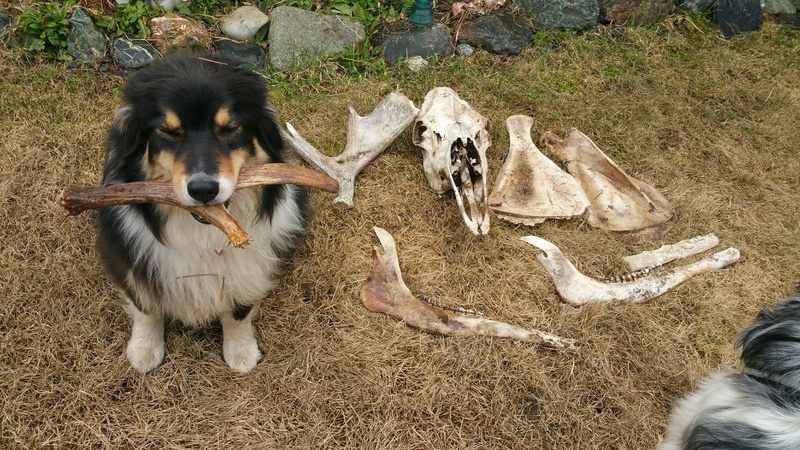 Every shed hunter dreams of finding that giant antler, but hey, bone is bone, and I will be happy for this – our first outing. BTW – Brody found the small antler buried in the grass. I sam him sniffing in the grass, pawing a bit, and went over to investigate, and there it was! I made a great big deal out of it – encouraging him so that he knows we want to find more. I doubt he will bring them to me as a retriever would, but if I keep an eye on him – perhaps we can duplicate what happened today. 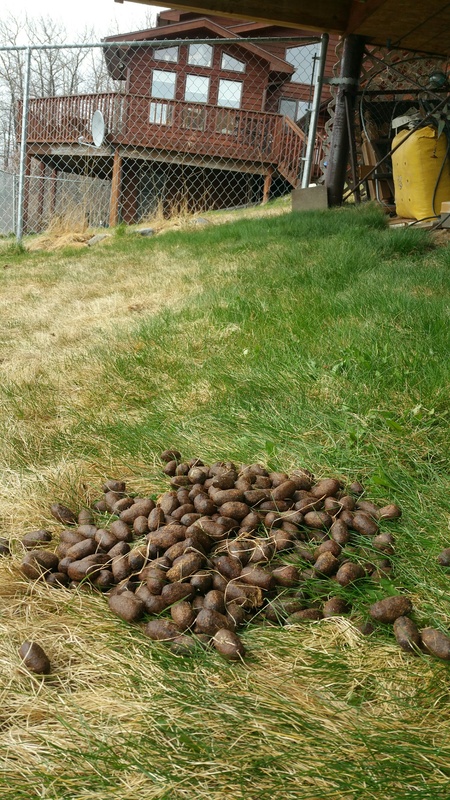 As you can see from the photos below, the dogs are very proud of our find – especially Brody. Otherwise, we are working about the house, inside and out, every day, preparing for the busy season. We have guests on and off throughout the week, but usually on weekends they come down from Anchorage. On Friday, Charlotte and Denise from Anchorage, and Andreas from Germany went out with me on the ocean for a four-hour tour. Unlike Gilligans 3-hour tour, WE went out and saw lots of beautiful wildllife and scenery, and everyone arrived back safe and sound in Homer at the expected time. Thanks to our guests for the business, and if you happen to be in Homer and want a personalized trip – look me up! Brody shows off his find! Brody and Blue with our Treasure.